Setting up a credible and reliable Alarm System is the basic security requirement for both corporate houses and residential communities. The need for a comprehensive and modernized alarm system is to help alerting the people in-charge about any possible breach. It may be related to theft or it could also be about any accident which can be averted if alerted in advance. CompuGeeks have the team of expert professionals who work in the area of security management with an exclusive focus on alarm systems. They have been maturing with time and there are several up-gradations on the older systems based on the present day security assessment of possible threats. As a corporate organization or a household, it is important for you to be aware of the vulnerabilities and accordingly work towards installing the alarm systems. They are very helpful in bringing down the human dependence as well as resource expenditure. Since the modern devises are made out of electronic processers, security can be linked to your personal mobile phones. Once you are aware of the threat perception, it is very easy for you to take necessary action which is the core principle or application behind installing a sensor alarm system. The new age systems are equipped to detect smoke, heat and other dreadful emissions like carbon dioxide or carbon monoxide in the air. They act like sensors and create buzz to alert the owners about possible accident. Such abnormalities may usually point towards fire accidents. 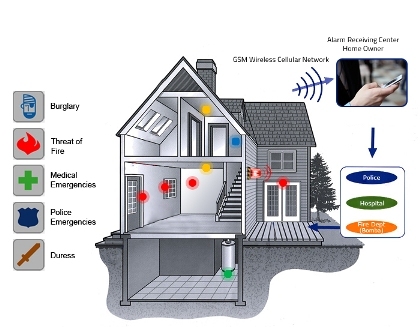 As part of home security management, motion sensors are serving as better alarm systems. They cover large arena of space and give a clear sense of people movements. They are enabled with ultrasound and infrared techniques. False alarms are one of the disadvantages with these sensors which are been sorted out by the researchers. There are several other options that can be explored. They include photo electric beams, driveway alarms, microphonic systems and secured electric fence. All these options have their own set of advantages and certain limitations as well. Our role as expert security advisors and technology providers for the Alarm Systems would positively help your business or community. We guide you to make a proactive choice about how you prefer to self-manage your facilities from the angle of threat perception. Our recommendations are based on your personal preferences and we are completely flexible when it comes to the aspects of cost and expenditure. The best part about our services is that you will be provided with different options with quality variants. You can make an informed decision based on our assessment and orientation. The advantages of seeking Alarm System Installation Services in Sydney are pretty clear for one and all. When there is demand for stuff like Alarm System Installer near me, one must be considerate about the options available. It must be classified into the brand of choice as well as the team that deals with the core process of Alarm System Installation Sydney. Compugeeks facilitate that kind of a set up and environment for the customers to deal with their day to day challenges with security. For the residential communities and commercial establishments, the need to spend on security arrangements is a well known reality. But, this is never restricted to any one aspect of the facility. Security is always not looked at from the perspective of theft alone as alarm system installation services would essentially deal with wide range of situations. It also has to be looked at from the angel of people who occupy the same as their priorities are to be taken into account. Ideally an alarm system installer would look at the prospective threats associated with a particular facility. When there are so many people involved in managing a system, the access and controls are to be shared with all of them in a very responsible manner. Given the complexity and the level of challenges involved in designing and implementing the Alarm System Installation Services, it gets pretty clear that only a seasoned service provider can effectively handle all the aspects of installation without leaving any room for complacency. In order to provide such high quality services, we always keep our teams on the stand by which is applicable for both installations as well as servicing part of the process. We assume complete responsibility once you reach out to us as a customer and we do everything with due diligence and reasonable considerations.